Location: Cherry Ct. @ Walnut Ave. Comments: Evergreen conifer native to Japan. Dark green very small scale-like leaves tight to the branch, small round cones and rough gray-brown bark. There are various cultivars of this plant some low growing and some to 60' with 20' spread. 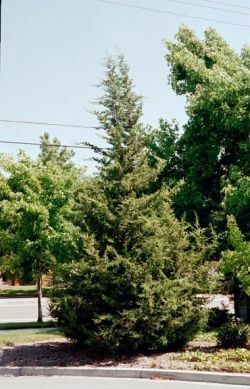 Specimen tree is about 10' tall.